What would you do if you didn’t have a wireless connection (either your own or borrowable) in your apartment? For 4 months? Al and I have tried to get creative as we suffer through a forced temporary living nightmare meaning no TV, no internet, a broken Wii and a broken freezer (unrelated but still painful). Our first month was spent reading to each other. I joined the herd picked up The Help occasionally reading random parts aloud while Al played Nuts! next to me. He finally reached his breaking point one night and snatched the book from my hands claiming my accent was “ALL WRONG. That’s not how they sound.” He proceeded to read 3 pages of narrative in a heavy Southern accent in his best attempt to personify a large, black woman in the Civil Rights era. The act was tough to buy given his girthy beard and high pitch growl but story time soon became a great alternative to electronic entertainment. Eventually we started exploring cafes with free wireless internet. The Native Bean is tucked next to Key Food on 4th and Avenue A in the East Village. The lack of signage both outside and inside the cafe force patrons to work for their Foursquare check-ins. The menu is robust for a cafe. 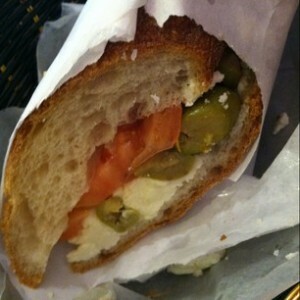 My favorites include their everything bagel with scallion cream cheese, cheese danish and feta, tomato, olive sandwich. Having work off for Labor Day on Friday, I set up base at Native Bean. There were plenty of open seats so the staff had no problem with me nursing my sandwich for 2 hours. They even recognized me when I came back for a snack in the afternoon.